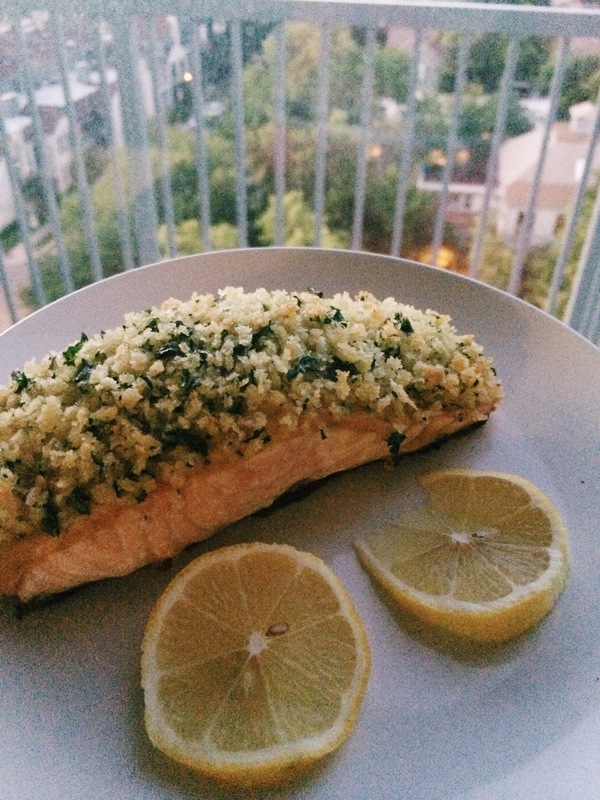 Excuse the photo quality…does the presence of panko bread crumbs make photos exceptionally grainy or what?? I call this work of mediocre art Panko-Crusted Salmon O’Er West Campus. Absence of my sister’s fancy camera aside, this is by far my new favorite Ina salmon recipe! Woo! SO good. The crust is a mix of panko, parsley, lemon zest, and olive oil, and you put down a layer of Dijon mustard to make the crust stick to the salmon. It’s crunchy and flavorful and the mustard makes it taste almost buttery (??). I found myself scraping the salmon skin just so I could eat as much of it as I possibly could. Seriously. Amazing. I went grocery shopping today after kind of dinner-planning my week. Y’allllll……meat’s esssPENSIVE. The thought of having to purchase food for the rest of my life is exhausting. And I see a lot of dollar signs that I don’t have. But cooking still brings me so much joy. I find myself wondering whether or not I’m making smart choices, wanting to spend money to cook myself nice meals every day instead of eating out or eating cheap ramen. But then I realize that this is what the rest of my life’s going to be. So I might as well start now.